Tap Contacts on the Home screen or in the Dock within the Phone app. If you want the new contact to be part of a group, tap the Group button at the top of the screen. You won’t see this button if you don’t have any groups. Deselect all but the group you want the new contact to be part of. You can add only to a group that resides on your iPhone — not a remote group such as Facebook. A check mark indicates which group is active. Even if you add a contact to a group, it is part of both All Contacts. Despite the outcry of many Contacts users, Apple has still not added a create groups function within the iOS Contacts app. Groups you create in other contact management apps that you access from Contacts are reflected. If you use iCloud, you can sign in to your account from a computer, click Contacts, and create groups there. A New Contact screen opens. Tap in the field that reads First. The cursor appears in that field and the keyboard opens. Type in the first name of your new contact. Not all contacts have first and last names and you are not obligated to fill in any field that you don’t have information for. If you just have the name and phone number of a company, you can fill in only those fields. Tap Return to move from one field to the next. Continue typing in the information you have for your contact. If you have contacts from more than one account, for example a Microsoft Exchange account as well as contacts on your iPhone, select the default account where new contacts will be saved by tapping Settings→Mail, Contacts, Calendar and then tap Default Account in the Contacts section. 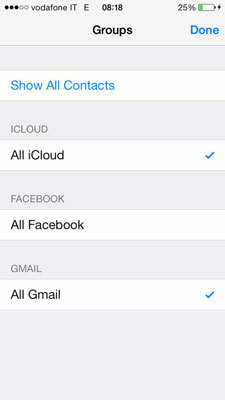 Tap the account you want to use or On My iPhone to automatically place new contacts on your iPhone.